Standard & Poor's Rating Services said yesterday it lowered its corporate credit rating for Hawaiian Telcom Communications Inc. to CCC+ from B-. The downgrade is based on the rating agency's assessment that the company's liquidity won't be sufficient to service debt and fund operations through 2009. The Honolulu-based telecommunications company had about $1.1 billion in debt outstanding as of June 30. Standard & Poor's outlook is negative. Interisland carrier Island Air said it furloughed five, or less than 2 percent, of its 300 employees yesterday because of lighter seasonal travel. "We beef up during the summer months and are restaffing and adjusting to respond to the next travel season," outside spokeswoman BJ Whitman said. She said the seasonal shift is a typical industry practice. Interisland ocean shipper Young Bros. Ltd. said yesterday it will debut a state-of-the-art freight processing and shipment tracking system called FACE, standing for freight and container equipment. The system is part of a 10-year, $186 million plan to improve its equipment and infrastructure and will be introduced during the next few months. It will be able to track containerized shipments, provide e-mail notification of the shipment's availability and allow for a single shipment number. Hawaii's hired agricultural workforce totaled 6,200 workers during the July 6-12 survey week, down 2 percent from a year ago, according to the state Department of Agriculture. There were 1,150 field pineapple and sugarcane workers, down 4 percent from the same week a year ago. The average wage was estimated at $13.33 an hour, 4 percent higher than 2007. Hawaii fresh papaya production is estimated at 2.4 million pounds for June, declining 16 percent from May, but increasing 8 percent from a year ago, the state Department of Agriculture said Monday. Output for the first half of 2008 is estimated at 15.8 million pounds, 15 percent more than a year earlier. Growers reported hot and dry weather for June as well as an increase in pests. Northwest Airlines said yesterday that it has government approval to expand its codeshare flights with Delta Air Lines on all Northwest trans-Pacific flights. Northwest will also add Delta to three of its Narita-Asia routes. Effective for travel beginning Aug. 30, expanded Northwest and Delta codeshare markets include trans-Pacific travel from Detroit, Minneapolis/St. Paul and Honolulu. The expanded codeshare markets will augment existing trans-Pacific codeshare flights from Portland, Seattle, San Francisco and Los Angeles. JAL Group, the parent of Japan Airlines, said Monday it has filed an application with the Japanese Ministry of Land Infrastructure, Transport and Tourism to revise its fares for travel from Japan to the U.S. mainland and Hawaii by 10 percent. The increase would be apply to Japan departures starting Oct. 1, subject to approval. Fares for travel from Japan to Africa, Asia, and the Middle East would increase by 5 percent. The company said it is battling an "extraordinary increase in operational costs." The Hawaii Superferry said yesterday that it has transported 125,000 passengers since starting service in August 2007. Calvin Poouahi from Wailuku, who traveled on the Alakai yesterday, was the ship's 125,000th passenger. Passengers have traveled on more than 400 voyages, Superferry President and CEO Tom Fargo said in a statement. The Alakai seats up to 800 passengers and carries approximately 200 vehicles. The ship sails daily between Oahu and Maui. 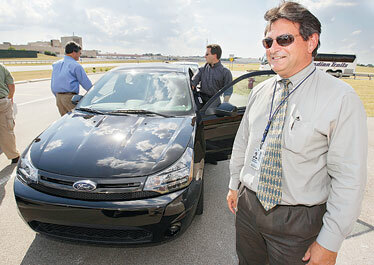 TEST DRIVE: Ford Motor Co. employee Andrew Sarkisian, above right, smiled after driving a 2009 Ford Focus Monday at Ford's proving ground in Dearborn, Mich. The company is trying to boost employee confidence by letting them drive the vehicles it hopes will pull the automaker out of a sales slump. * Rose Begonia as public relations associate. * Ryan Brant as graphic designer. * Barbara Scott to local sales manager from senior account manager of KHNL/K5. Her previous jobs include senior account manager at Hawaiian 105 KINE, KGMB 9, XtremeRadio 104.3 and Krater 96; and sales manager at Pacific Business News and Hawaii Business Magazine. * Deryl Seino to sales research director. He joined in 2004 as a sales assistant and will also continue his duties as sales and marketing executive for KHNL/K5. » Advantage Rent A Car has named Kevin Lake as general manager in Hawaii. He replaces Karl Taylor, who will return to the mainland to manage the new Advantage Rent A Car location opening in Tuscon, Ariz. Lake is currently general manager at Seattle-Tacoma International Airport, and will oversee the Maui and Honolulu rental locations starting Aug. 18. * Jennifer Dunn as vice president of finance. Her 18 years of finance industry experience include senior financial analyst for Ocean Kayak in Ferndale, Wash. and vice president of finance at Kettle Foods in Salem, Ore.
* Grant Marcouillier as brewery representative. His eight years of food and beverage industry experience include contemporary marketing representative at Anheuser Busch Sales of Hawaii.